Move over granola bars, these no bake chocolate chip energy balls are in town. So many tiny kids have trouble making it all the way through a big bar, that a fun little ball like this can be a great bite-sized snack. Even better this chocolate chip energy bite recipe doesn’t require any time in the oven and are super simple to make with just a few simple ingredients. So in our kitchen, the kid has been asking to help more often. She has always been welcome in the kitchen, but lately, she wants to get up in the sink to rinse in the colander, peak more in the stove and get right up there in the bowl where I’m mixing. She’s always welcome, but it can be a bit nerve-wracking with a kid underfoot. 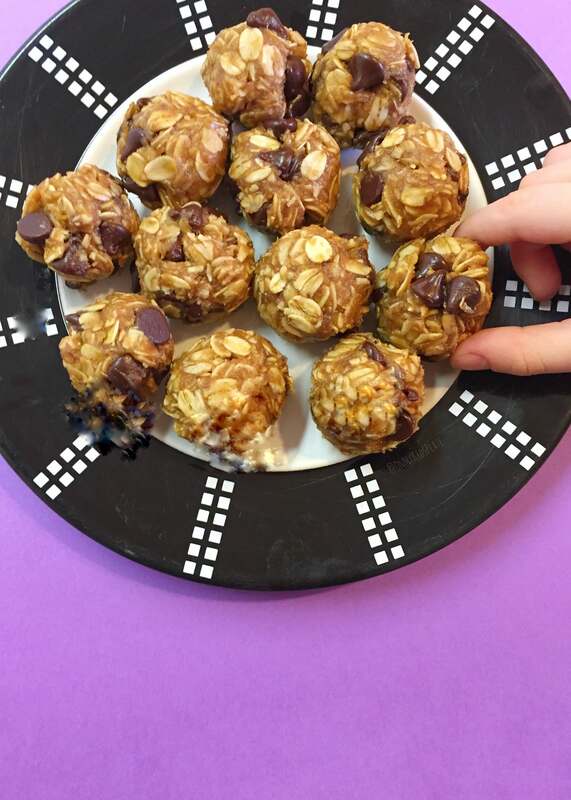 Take your time and go easy on the recipes, which is where these no-bake chocolate chip energy bites are perfect. One of the prized kid jobs in the kitchen? It’s without a doubt mixing the bowl. Sure cracking eggs is fun, but that only lasts for a minute or so. Mixing the bowl is where the real magic happens, and where the recipe starts to become magic in the bowl. That magic doesn’t happen though without a little mess on the floor and the counter that I’ll be cleaning until next week. I’d like to say I’m super patient in the kitchen, but I’m not always. It’s hard when you need to cook quick or they just aren’t listening and are dancing by the stove sometimes. But I’ve been trying to make more of an effort to cook together. This is a great recipe to make together, plus the banana and peanut butter snack combo? Delicious! One more thing! 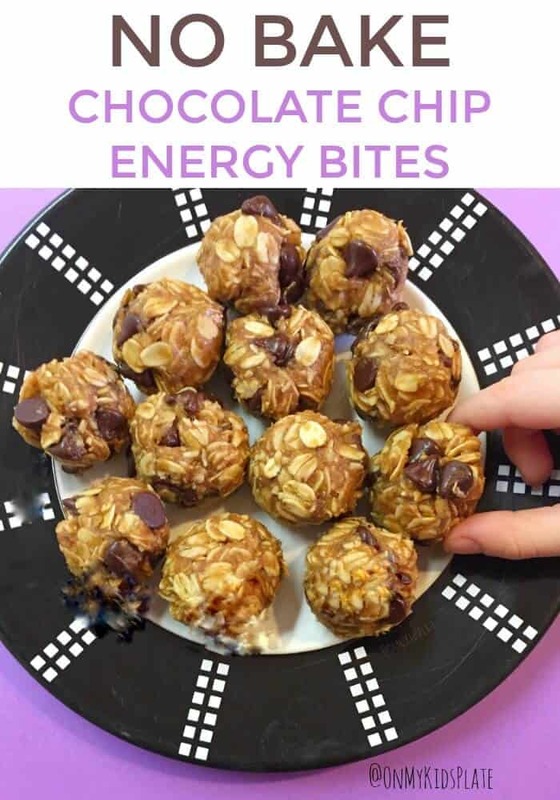 While we do reach for the packaged bars in our house sometimes, mixing it up between packaged and homemade will bring lots of smiles, and these no bake chocolate chip energy bites also freeze nicely so make’m in a big batch! 🙂 Chocolate chip energy bites for dayssssss I’m telling you! 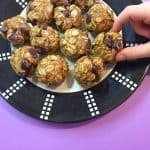 No bake chocolate chip energy bite are a great sweet dessert or snack for lunchboxes after school or a sweet little pick me up. Make a big batch of these and freeze, you'll thank me! 2 tbsp chia seeds This is optional, but packs a little extra nutritional punch! Mash banana with the back of a fork, taking care to break apart any chunks. Then add to bowl. Add peanut butter, honey, vanilla extract and chia seeds. Stir until mixed well then add oats. Keep stirring. Roll into round balls about the size of a ping pong ball. Chill in the freezer for 20-30 minutes to set. This recipe makes roughly 24-30 bites. Bites can be eaten right away, but for best results chill in the freezer or fridge for a minimum of 20-30 minutes first. Store in an airlocked container for 3-4 days, or freeze for later! So have you been on the energy bites wagon or are you more of a bar family? What other flavor combos would you like to try? These look amazing! Definitely making them! Made these with my girls tonight because we had some riped bananas! Will quick cook oats work for this recipe? Hi! Yes, quick cook oats will work in this recipe with no problems at all. Hope you love them!